1 Department of Plant Genetics, Institute of Plant Sciences, ARO, The Volcani Center, Bet-Dagan, 50250 Israel. 2 Department of Botany, Karnatak University, Dharwad, Karnataka 580003, India. 3 Department of Plant Biology and Plant Biotechnology, St. Joseph's College, Tiruchirappalli, Tamil Nadu 620002, India. An efficient protocol for organogenesis through leaves has been established for Launaea sarmentosa (Willd.) Sch. Bip. ex Kuntze, a highly valuable medicinal plant. The leaf explants produced microshoots on MS basal medium when fortified with cytokinins and auxins. A combination of 6-benzylaminopurine (BAP) at 0.5mg/l and naphthaleneacetic acid (NAA) at 0.2mg/l resulted in the induction of high frequency microshoots in 30 days. The microshoots were successfully subcultured for shoot elongation and eventually for rooting on MS medium supplemented with indole-3-butyric acid (IBA) at 0.5mg/l. The regenerated plantlets were hardened under greenhouse conditions and transferred to garden, resulting in a 90% survival rate. Keywords: Asteraceae, Launaea sarmentosa, Leaf explant, Organogenesis. Launaea sarmentosa (Willd.) Sch. Bip. ex Kuntze of Asteraceae has been traditionally used as a folk remedy in India. The roots are exploited for the cure against jaundice, as a lactagogue and to purify blood, especially by the tribes of the Western Ghats, a biodiversity hotspot. It has also been used as a coolant, diuretic and demulcent against allergic infections (Anjaria et al., 2002). The habitat of the herb is under increasing anthropogenic, as well as natural pressures, and hence calls for proper management through local measures of protection. The development of in vitro techniques for the culture of isolated plant organs, tissues and cells have led to several exciting opportunities, as well as applications in plant biotechnology. They have allowed widespread use of cell cultures for genetic improvement and plant propagation for production of commercially useful products (Cocking, 1990). Plant propagation via organogenesis is a relatively recent technique used to mass-produce plantlets within a short span of time. The development of a protocol for direct shoot organogenesis has not only useful in micro-propagation, but also opens up alternative ways of introducing novel traits via genetic transformation (Unda et al., 2007). Direct organogenesis of various plant species including many medicinal plants has been well reported (Raghu et al., 2006; Guo et al., 2007). The present investigation was carried out to standardize a rapidly reproducible protocol that can be employed at a commercial scale for clonal propagation. Moreover, it also aims at determining the most appropriate growth regulator concentration and combination that can induce direct regeneration of leaf midrib as a source of explant. L. sarmentosa was collected from the coastal area of South Arcot District, India by Mahesh (2007) and grown in the experimental garden of the Department of Plant Biology and Plant Biotechnology, St Joseph's College, Tiruchirappalli, India. Three-day-old (0.5- 1cm diameter) leaf midribs were harvested and washed thoroughly with running tap water for 15 minutes before being washed with aqueous solution of 5% (v/v) Teepol (Reckitt Benckiser, India) for 3 minutes. Then they were washed with 1% (v/v) Bavistin (BASF Ltd, Mumbai) for 3 minutes, followed by rinsing with sterile distilled water and 70% (v/v) ethanol for 1 minute. Finally, the explants were given five washes in sterile distilled water. The explants were disinfected with 0.1N HgCl2 and a final washing was given in sterile distilled water. The midrib explants were dissected out and blotted on sterile filter paper discs before inoculation. The explants were cultured initially on Murashige and Skoog medium (MS; Murashige and Skoog, 1962) containing 3% sucrose (w/v) and 0.8% agar (w/v). The medium was supplemented with 6-benzylaminopurine (BAP; 0.1-1mg/l), alone or in combinations with naphthalene acetic acid (NAA; 0.1-0.5mg/l) at pH 5.7. Culture vials of 150x20mm size containing 15 ml medium with the explants were maintained in a growth chamber at 25±2°C with a photoperiod of 16hrs of 40µ mol m-2s-1 white fluorescent lights (Philips, India). The same conditions were continued for shoot multiplication and rooting experiments later. Subsequently subcultures were performed at three week intervals on fresh replenished medium during the regeneration periods. Multiple shoot induction was initiated on MS medium supplemented with BAP (0.1-1mg/l) and NAA (0.1-0.5mg/l). A control treatment without cytokinins was also included. Successful observations were recorded from 4 weeks and the frequency of microshoot proliferation was determined as percentages of responding explants and the number and length of shoots per explant. Roots were initiated on 3-5cm elongated individual shoots that were isolated from the subcultures and carefully transferred to MS medium containing indole-3-butyric acid (IBA, 0.1-1mg/l). After 4 weeks, calculations were made on rooted shoots, number and length of roots per shoot. Well developed rooted plantlets were transplanted to plastic pots containing an autoclaved mixture (1:1:1) of garden soil, sand and vermiculite, and kept in a growth chamber under a day -night temperature of 25±2°C and a photoperiod of 16hrs 40ì mol m-2s-1 cool white fluorescent lights. All the plants were irrigated with MS basal salts every three days. The hardened plants were maintained under controlled conditions for 30 days and they were acclimatized in garden. Experiments were set up in a Randomized Block Design (RBD). Each experiment has triplicates and each replicate consisted of at least twenty explants. Ten to fifteen explants were used per treatment in each replication. Mean treatment was compared using Duncan's Multiple Range Test (DMRT) at P<0.05 probabilities as per Gomez and Gomez (1976). The responses of leaf explants regarding direct organogenesis and growth are presented in Table 1. Shoot multiplication was found to be very difficult with leaf explants because the leaves were located in the basal rosette at ground level. The percentage of responding explants during the multiplication phase was high (70-100%) regardless of the cytokinin (BAP) used and the concentration maintained. Vials without growth regulator produced on an average of 5.8±0.7 shoots per explant after four weeks. In contrast, the presence of BAP resulted in the formation of a larger number of shoot buds. Within 2 weeks of incubation, direct organogenesis was observed on the surface of leaf explants. 0.5mg/l of BAP resulted in higher number of shoots with an average of 12.6±0.7 and 2.0±0.05cm length of the shoots per leaf explants (Fig. 1a; 1b). 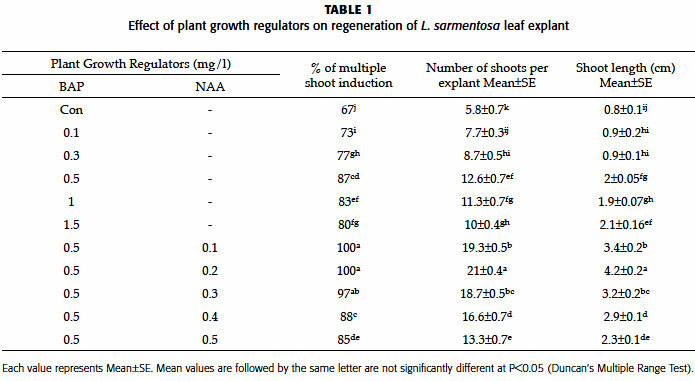 BAP is a very effective growth regulator for shoot multiplication among medicinally important plants such as Pterocarpus marsupium (Anis et al., 2005) and Watsonia sp. (Ascough et al., 2007). A combined BAP (0.5mg/l) and NAA (0.2mg/l) produced 21±0.4 microshoots per explant and 4.2±0.2cm long shoots. It appears the explants of L. sarmentosa required high cytokinin (0.5mg/l BAP) and low auxin (0.2mg/l NAA) for shoot multiplication (Fig. 1c; d). The recorded results are in agreement with previous reports observed with high BAP combined with low NAA for high quality shoots (Maheshwari and Kumar, 2006; Sivanesan and Jeong, 2007). Rooting of elongated shoots was observed with IBA (0.1-1mg/l). On hormone free MS basal medium, the response was low and the mean number of roots was 2.3±0.7 and length of roots was 1.0±0.1cm per shoots after 6 weeks of culture (Table 2). The best rooting response was obtained after 4 weeks of culture with IBA (0.5mg/l) (Table 2; Fig. 1d). The majority of roots developed in 4 weeks. Similar results were reported earlier in Embelia ribes (Raghu et al., 2006), Penthorum chínense (Cao et al., 2007) and Sterculia urens (Hussain et al., 2007). The in vitro cultured plantlets that were directly transferred to foam cups showed a high rate of mortality. The potting mix composed of garden soil: sand: vermiculite (1:1:1) and they were covered with transparent polythene bags for two weeks to ensure higher humidity. 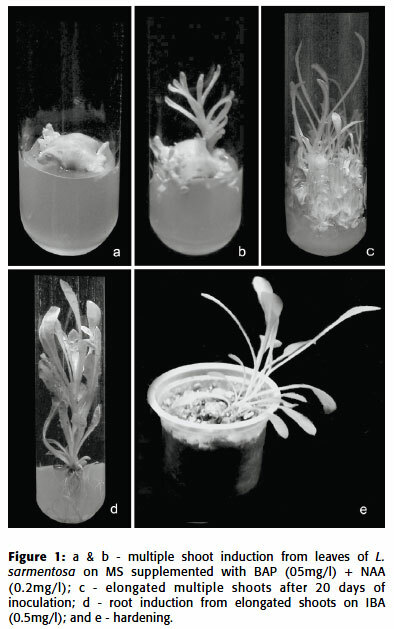 The potted plantlets that were kept under in vitro conditions were found to be hardened for survival (Fig. 1e). The procedure employed to acclimatize the transplanted plantlets ended up with successfully hardened plants that were established in garden with a 90% survival rate. The protocol established in this study can be used for the efficient multiplication of L. sarmentosa. Plantlets produced from this protocol will contribute to the rehabilitation of L. sarmentosa and help to a greater extend to reduce the pressure on the natural population. Received: August 26, 2009. In revised form: October 12, 2010. Accepted: September 2, 2011.